Former U.S. vice-president Al Gore, accepting his Nobel Peace Prize yesterday, called on the United States and China, the world’s two largest polluters, to make the boldest moves on climate change or stand accountable before history for their failure to act. Both countries should stop using each other’s behaviour as an excuse for stalemate, Gore said, labelling the threat from rising temperatures and sea levels a planetary emergency, a threat to the survival of our civilization that is gathering, ominous and destructive. The future is knocking at our door right now, Gore said, paraphrasing the Norwegian playwright Henrik Ibsen during a 90-minute ceremony in Oslo’s City Hall. Make no mistake, the next generation will ask us one of two questions, Gore said. Either they will ask: What were you thinking? Why didn’t you act? Or they will ask instead, How did you find the moral courage to rise and successfully resolve a crisis that so many said was impossible to solve? Gore added: It is time to make peace with the planet. 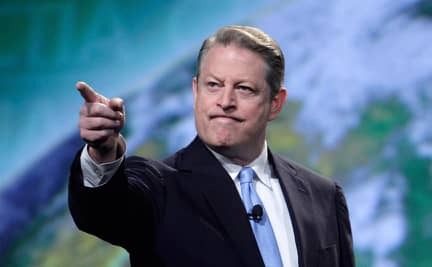 Gore said the price of inaction is rapidly causing melting glaciers, massive crop loss due to drought, the extinction of some species and the displacement of millions of people by flooding. He called on all nations to mobilize with a sense of urgency and shared resolve that has previously been seen only when nations have mobilized for war. Sometimes, without warning, the future knocks on our door with a precious and painful vision of what might be. One hundred and nineteen years ago, a wealthy inventor read his own obituary, mistakenly published years before his death. Wrongly believing the inventor had just died, a newspaper printed a harsh judgment of his life’s work, unfairly labelling him The Merchant of Death because of his invention — dynamite. Shaken by this condemnation, the inventor made a fateful choice to serve the cause of peace. Seven years ago tomorrow, I read my own political obituary in a judgment that seemed to me harsh and mistaken — if not premature. But that unwelcome verdict also brought a precious if painful gift: an opportunity to search for fresh new ways to serve my purpose. Unexpectedly, that quest has brought me here. Even though I fear my words cannot match this moment, I pray what I am feeling in my heart will be communicated clearly enough that those who hear me will say, We must act. The distinguished scientists with whom it is the greatest honour of my life to share this award have laid before us a choice between two different futures — a choice that to my ears echoes the words of an ancient prophet: Life or death, blessings or curses. Therefore, choose life, that both thou and thy seed may live. We, the human species, are confronting a planetary emergency — a threat to the survival of our civilization that is gathering ominous and destructive potential even as we gather here. But there is hopeful news as well: we have the ability to solve this crisis and avoid the worst — though not all — of its consequences, if we act boldly, decisively and quickly. However, despite a growing number of honourable exceptions, too many of the world’s leaders are still best described in the words Winston Churchill applied to those who ignored Adolf Hitler’s threat: They go on in strange paradox, decided only to be undecided, resolved to be irresolute, adamant for drift, solid for fluidity, all powerful to be impotent. So today, we dumped another 70 million tons of global-warming pollution into the thin shell of atmosphere surrounding our planet, as if it were an open sewer. And tomorrow, we will dump a slightly larger amount, with the cumulative concentrations now trapping more and more heat from the sun. I thought some of you might find this interesting, hopefully. What were you thinking? was published by Daniel Menjívar on December 11, 2007 at 12:38:23 PM MST and last updated on April 18, 2019 at 4:40:39 PM UTC .